Everbody saw Baltimore all over the news in early May. Rioting, looting, and general mayhem seemed to be everywhere. Was Baltimore really in flames, or was this just a lot of media coverage about a serious problem, but only in a small part of the city? Since Baltimore is my favorite close by big city, and I figured they needed the business, I drove up on a Saturday. Assuming no major traffic tieups getting around Washington, you can get to the southern end of Baltimore in a little over five hours. This time I chose to leave the car in a supermarket parking lot, near the suburb of Riviera Beach. 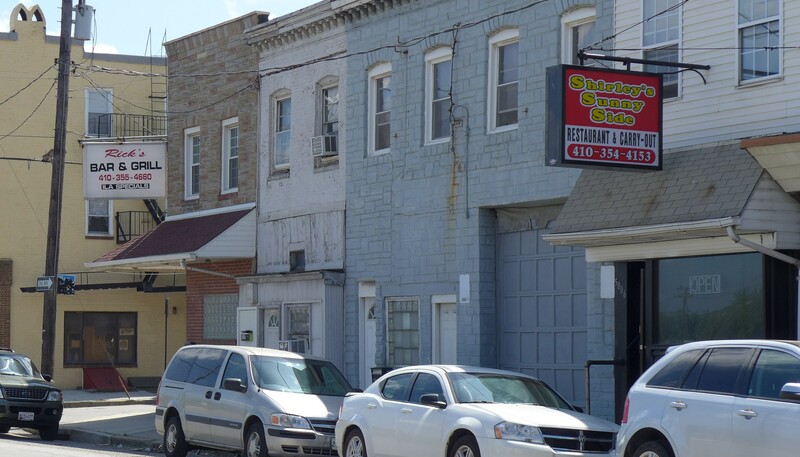 The south side of Baltimore has always been the less trendy side; the rich blue bloods mostly live on the north side. Riviera Beach sounded exotic, but turned out to be the kind of working class white neighborhood where people drove pickup trucks and rode Harleys. One assumes people moved here from inner city Baltimore in droves when these houses were built in the nineteen forties and fifties. I ate lunch in the Burger King there. There were lots of elderly people. Bicycling out of Riviera Beach, after passing other suburbs like Pasadena, I biked through several miles of decaying chemical plants, waste dumps, junkyards, and brownfields. Looking over the industrial squalor, one can finally see the tall buildings of downtown off in the distance. The city started suddenly; dense row houses appear immediately beside what looked like a refinery when I glided into the somewhat rough neighborhood of Curtis Bay; which I think is inside the city limits. This ILA bar could have come from a scene from The Wire. Bicycling into Baltimore proper from the south is a little tricky; you have to cross several bridges before plunging into the narrow streets of row houses in yuppified Federal Hill. All of a sudden it is hipster central. 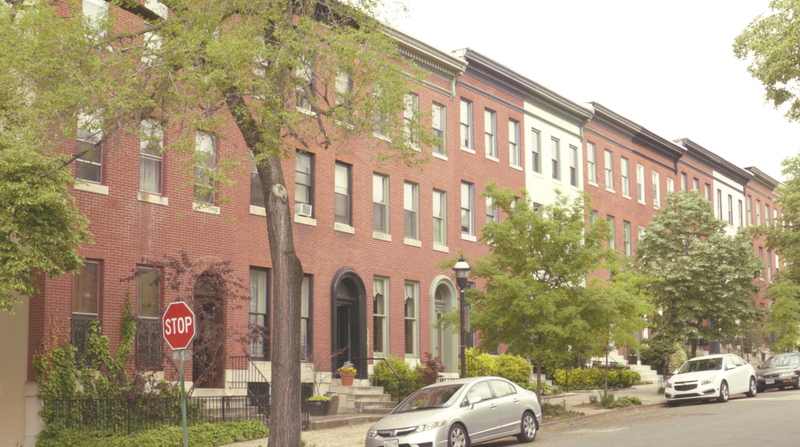 Like New Orleans and shotgun houses, Baltimore built itself with an urban self confidence of its own architectural style. 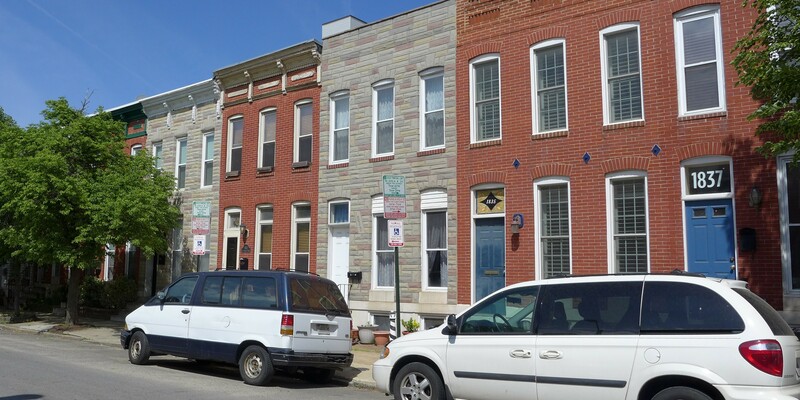 While not as beautiful as New Orleans, and maybe not beautiful at all, streets of row houses in Baltimore show a singular style as they repeat themselves across neighborhoods of all social classes. Neighborhoods like this stretch for many miles. I stopped at Porter’s in Federal Hill for a beer, and looked up places to stay on my cellphone. As expected, prices were really low; like $ 89.00 for a four star hotel. I checked in, then biked off to look at more of the city. On a beautiful late spring day, everything at least looked normal; crowds of people around Inner Harbor. That afternoon, and the next day, I bicycled around many parts of Baltimore. I knew I could not go everywhere. Like just about every city in America, there are many parts of Baltimore that would be dangerous for someone like me to visit on a bicycle. I had to keep my cycling to those gentrified parts of town where I felt safe. 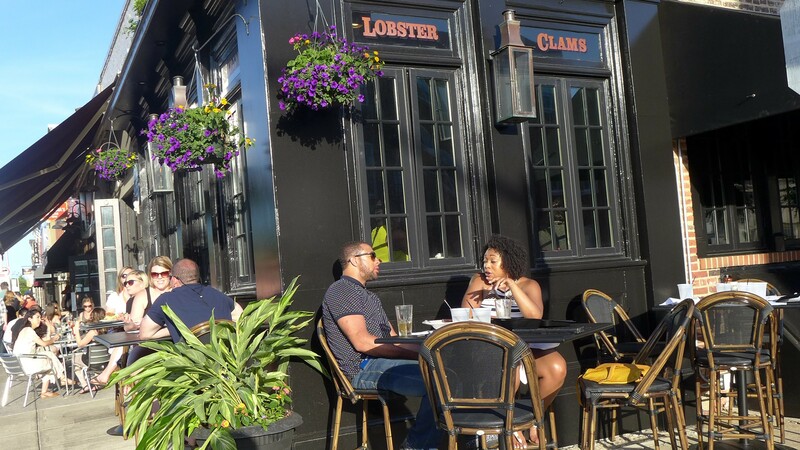 Unlike Chapel Hill, it was encouraging to see a large percentage of apparently middle and upper class African Americans, doing everything everyone else was doing, including having a drink on a sidewalk cafe Saturday afternoon, or doing brunch on Sunday morning. In comparison, Chapel Hill publicly shows much less of the diversity we would like to pride ourselves on. That evening, at a small Italian restaurant near my hotel, I was only one of two parties eating that night. One of two elderly ladies eating near me complained that the “national media” had ruined Baltimore’s reputation. She said that she had lived in the same area her whole life, including during the 1968 riots. She said those 1968 riots were essentially all over the city, while the current the current riots were only in a 1 – 2 block area; a part of town that few other residents visit. Everybody I talked to bitched about the recent 10:00 PM curfew, which was, thankfully, over. I took this to heart, because I know every city in America has some neighborhood that outsiders are scared to visit. This is a huge problem, and maybe Baltimore’s riots will inspire the nation to action. But Baltimore’s hotels and restaurants, far from where the rioting happened, should not have to bear this burden on their own. 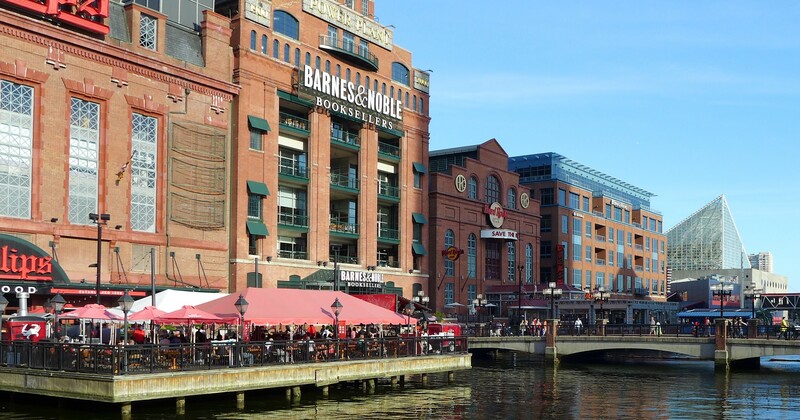 Baltimore has several handsome areas that are fun to visit. 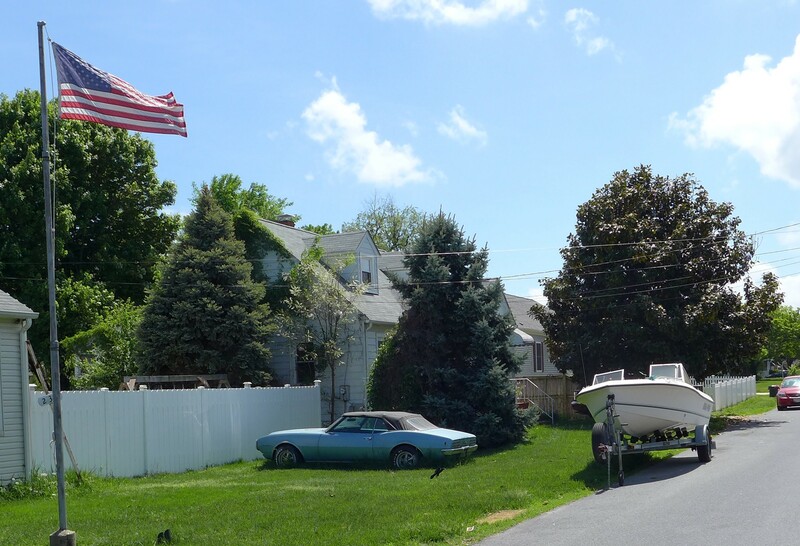 On Sunday morning, I bicycled through office buildings and row houses for over six miles to the neighborhood of Hampden, near Johns Hopkins University. 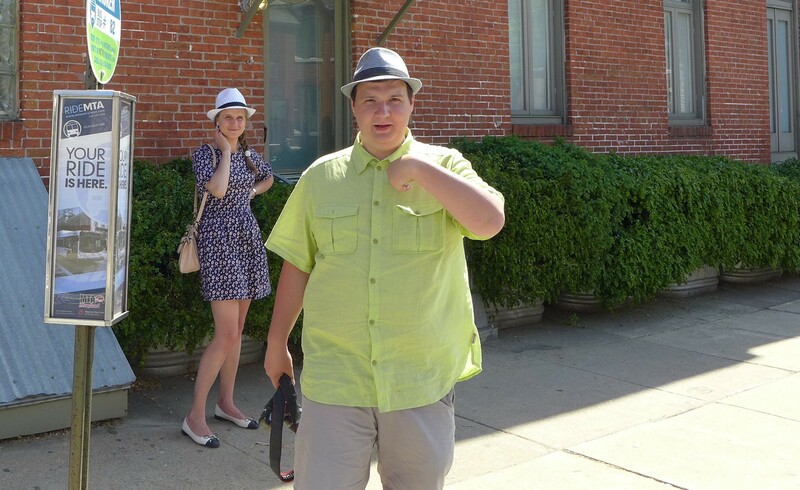 Compared to the restaurant the night before, this was even more hipster. By the time I left the place at about ten thirty in the morning, there were people waiting on the sidewalk for a table. I bicycled all over several other parts of the city, including Bolton Hill, which I had never visited before, and which was gracious looking and almost too well preserved and wealthy looking. I also realized that this area is a mere few blocks from where the rioting occurred in Sandtown. Eventually I worked my way south towards downtown, then across some bridges, for the ride back towards the car parked in a supermarket lot near Riviera Beach.